Dr. Yung invented the Mirage Pokémon system. This appears to be a project he spent many years on, as Professor Oak acknowledges. Yung is shown to have a combination of great intellect and battling skill, but still has a sort of mysterious air about himself. He challenges Ash and his friends to battle with him using a Mirage Aggron his system has generated. Misty eagerly accepts his challenge and uses her Staryu, but she lost easily when the Aggron showed off one of Yung's system's features - the ability to use any attack, in this case Bullet Seed. Ash challenged him next with Pikachu, but before the battle could begin, the Mirage Master (Japanese: ミスター・ミラージュ Mr. Mirage) captured both Yung and Oak by commandeering the system. Oak initially resisted the torture and refused to give the password. As a backup plan, Mirage Master used some of his Mirage Pokémon to capture Pikachu after ambushing it. He then strapped it to a table and used a special machine to scan its memories for data, causing it great pain. This finally broke Oak's resolve, and he surrendered the password, "REDGREEN." Using a combination of his new access to Oak's laboratory's database and his ability to hack the servers of Pokémon Centers worldwide, Mirage Master began forming his perfect Pokémon. When Ash, and later Misty and May arrived to confront him, Mirage Master completed the experiment, creating a Mirage Mewtwo. He demonstrated its power by instantly defeating all of the other Mirage Pokémon, then he attempted to kill Oak, who had to defend himself with a Dragonite. Oak urged the group to escape, becoming resigned to the fact that they could not save Yung, but Mirage Master had another trick up his sleeve - he deployed missiles to create a much larger field for the Mirage Pokémon to move around in, allowing him to unleash his Mirage Mewtwo on the world. To aid in this endeavor he also summoned a Mirage Entei, Mirage Articuno and Mirage Zapdos. Later, after the Mirage Master declared his Mirage Mewtwo to be the result of "many years of hard work", Professor Oak successfully unmasked him to actually be Dr. Yung. 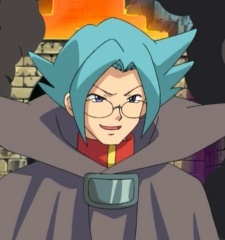 It was revealed that Yung had been a student at the Pokémon Institute when he invented the Mirage System, but he was expelled because his research was considered cruel, thus making him bitter and desiring revenge. He battled against the group using Mewtwo and easily took the upper hand, but with some timely help from the Mirage Mew that Yung had declared a "flawed specimen", Ash's Pikachu was able to defeat it using Volt Tackle. After being defeated, he escaped into his burning lab. Oak tried to pursue him, but falling iron blocked the entrance, and Yung was never seen again. It can be assumed that he is still at large, as Officer Jenny was unable to recover his body from the castle.